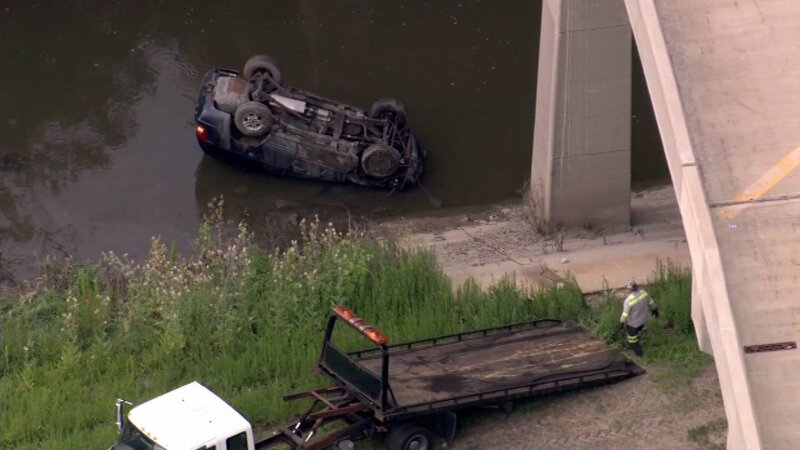 ROSEMONT, Ill. -- A driver was injured when a Jeep rolled over and plunged into a retention pond Tuesday morning on a Jane Addams Memorial Tollway ramp in northwest suburban Rosemont. The driver of the 2000 Jeep lost control shortly before 6:30 a.m. and the vehicle rolled over and then went into a retention pond off the ramp from eastbound I-90 to northbound I-294, according to Illinois State Police. A trooper was able to jump into the water, break a window of the Jeep and help the driver climb out of the submerged vehicle, police said. The driver suffered minor injuries in the crash. Additional details, such as hospital information and the driver's age and gender, were not immediately available. As of 7:10 a.m., the ramp was open to traffic, police said.